Tumours are an abnormal type of cell proliferation. They can grow anywhere in the body. 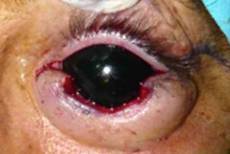 Thus we may have tumours on the eyelids, conjunctiva, intraocular, involving the orbit or the tear ducts. Tumours can be benign or malignant. 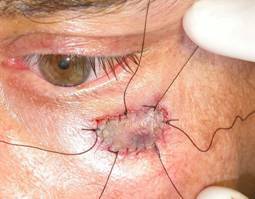 When your surgeon uses the word tumour he may be referring to a benign lesion, such as a papilloma, a nevus, etc. 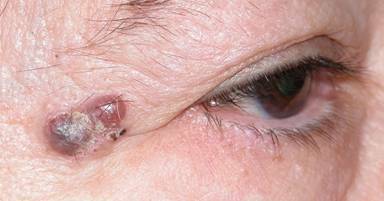 Frequently proliferative lesions on the eyelids are benign, such as papillomas (commonly known as warts), cysts, or nevi. 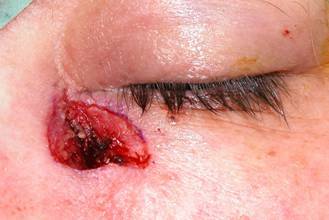 In malignant tumour lesions, the most common is basal cell carcinoma, which accounts for 90% of malignant tumors. It appears on the skin and grow by extension, with changes being visible. These malignant tumours are the least aggressive. They are not usually life threatening and rarely metastasize. 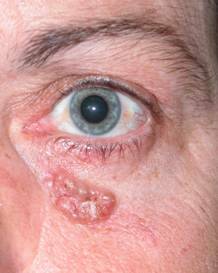 Other common lesions are squamous cell carcinoma. 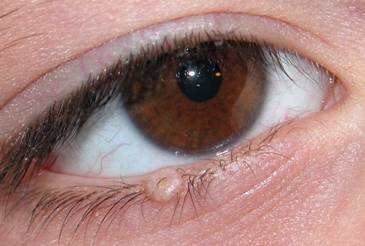 Here the degree of malignancy increases, they can damage to the eyeball and may also involve a potential risk to life. 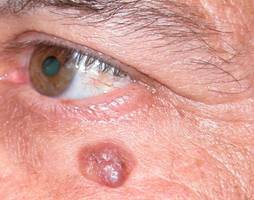 Even more aggressive tumors are sebaceous carcinomas and melanomas that have a high mortality rate. Most tumours have a multifactorial origin, and genetic factors influencing race and lifestyle, such as sun exposure and smoking. 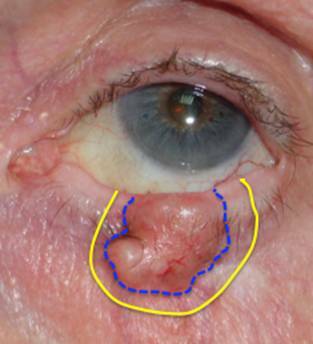 These features are not present in benign lesions. 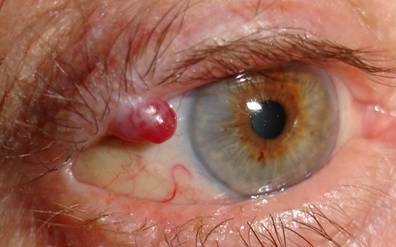 Malignant tumors can grow if left permanently damage the eye and sometimes produce distant metastases. 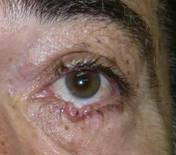 It is therefore mandatory that any new lesion be removed and sent to a pathologist for identification. 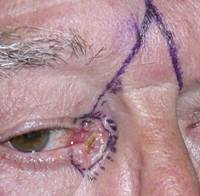 Do not forget that in addition to performing surgery to remove the tumor, we must reconstruct the eyelids. 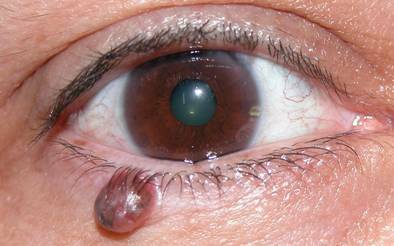 Large lesions require the use of more aggressive techniques that can later cause sequelae affecting the eyeball. Since malignant tumors grow slowly and are rarely painful, they tend to be underestimated by patients. It is a mistake that should be avoided. The patient should seek evaluation by a specialist in case of any suspected new growth, however insignificant it may seem. 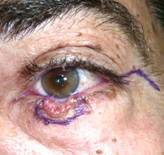 How are eyelid tumours treated? 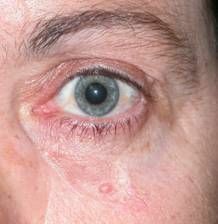 Your specialist will make an initial visual inspection to determine whether a lesion appears to be benign o is suspected to be malignant. 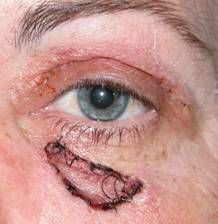 The next step is to perform biopsy or complete removal of the lesion in the operating theatre to confirm the presumed diagnosis. The biopsy may be reported or not at the same time of the surgery, depending on the possibility of having a pathologist in the operating theatre. 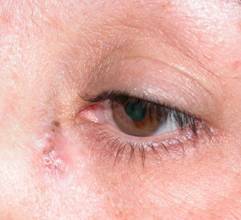 If confirmed by biopsy or if there is a high suspicion of malignancy, the oculoplastic surgeon may plan tumour excisional surgery with subsequent reconstruction. 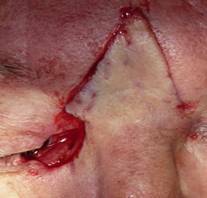 The patient should know that any malignant lesion should be excised in its entirety plus an added margin of safety. 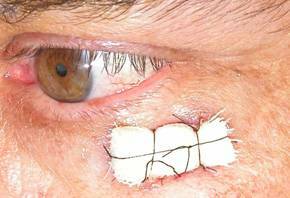 This makes the size of the lesion to be removed higher than that estimated by the patient. Early intervention is therefore crucial. 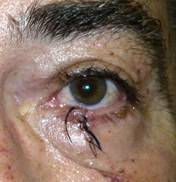 Currently whenever possible and with availability of an experienced pathologist, Mohs surgery is employed. This is a surgery that attempts to strictly eliminate the tumour, essentially avoiding damage to the surrounding healthy tissue. Samples are taken in sequence until they evidence healthy tissue. It can be a long and tedious process and may not always be available. Currently tumour removal surgery offers a very high cure rate above 95%. 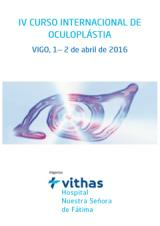 Your specialist oculoplastic surgeon is indicated for the reconstruction of defects after excision. 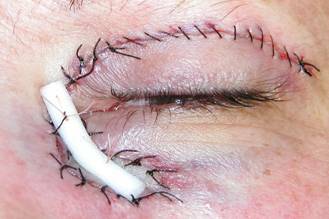 The aim of treatment is threefold, first anatomically reconstructing the remaining eyelid, secondly ensuring proper functioning and protection of the eye, and thirdly cosmetic. 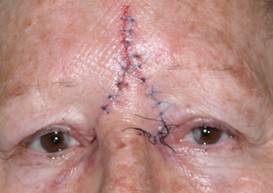 Depending on size, the best surgical approach for reconstruction is selected. There are many techniques, some being very complex. 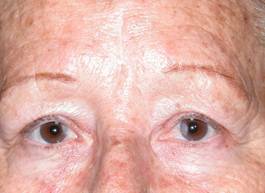 The results are usually very good even from a cosmetic standpoint. 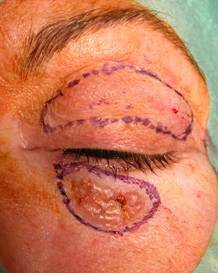 Squamous cell carcinoma removal and reconstruction with expanded direct closure and flap Tenzel. 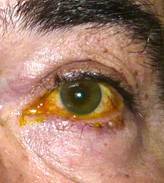 Sometimes other treatments may be employed such as radiation therapy, or eye drops with anticancer drugs, in tumours strictly involving the conjunctiva. Less frequently chemotherapy may be used. 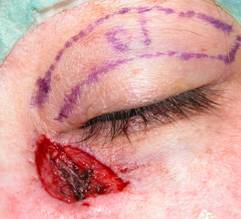 It is very rare for a tumour of the eyelid to compromise the patient's life or metastasise. 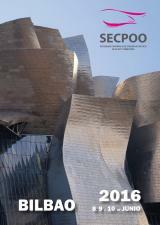 Serial systemic studies can be carried out depending on the type of tumour.